A node.js and redis powered crypto trading bot built to make simultaneous trades across multiple exchanges. Buy low, sell high! An app to automatically load all available coupons to your Kroger rewards card. A custom built application suite providing online document preparation, order fulfillment, automated customer service, credit card processing, and dispute resolution. A very advanced SEO tool to increase positions in Google & Bing indexes. Booby trap your inbox. When a hacker triggers a trap, get a text message alert. 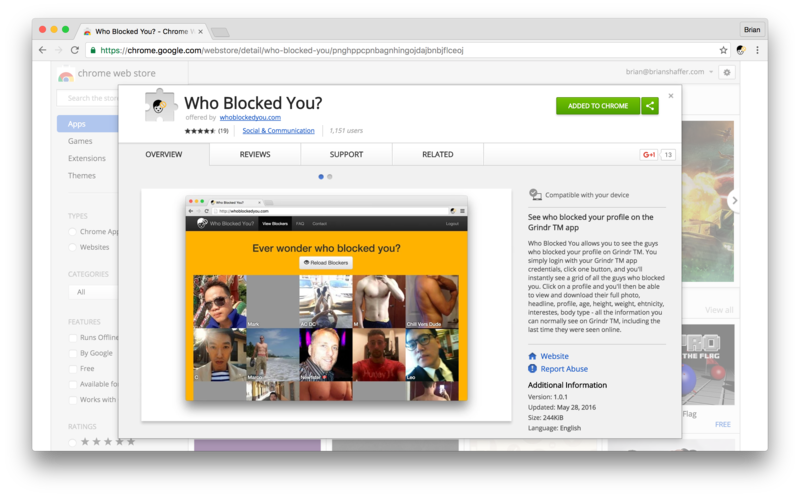 A Chrome plugin that shows which guys blocked you on Grindr. Version 2.0 of the Grindr API (stupidly) did front-end filtering of the block list. This Chrome plugin intercepted that packet and queried each profile on the blocked list. Shut down in 2016 with 1151 active users. A SoundCloud downloader. Automated marketing via Twitter bots. Scrapes prices and derives occupancy figures for all the hostels on the Colorado front range. High frequency bitcoin trading bot for Coinbase. Shut down after receiving this email from the CEO. A custom web application development & SEO agency. I teach front-end web development courses in Boulder, Colorado. Take one of my upcoming classes. A lot of BigCommerce & LightCMS theme creation. Sold over 2000 of these silly novelty dollar bills. A web game where you uploaded photos of your friends and could drag & drop funny wigs, clothing, and accessories over the photo. My first web design agency. Building PHP apps and basic 4 page websites. Initially just a funny videos & flash games portal. Pre YouTube; think Ebaum's World era. The whole StupidFest network grew 48 niche gaming domains and 1M monthly visitors. Thanks to my brother, Andrew, for buying me the best Christmas present ever - a domain & hosting :) The beginning of all this.